Thanks to well-developed tourism, Costa Rica has concentrated impressive amounts of international traffic. In Costa Rica, there is a stable mobile market as penetration of cellular communications is 152%. But to make voice termination successful, it is not enough to install the business VoIP hardware and select the optimal tariff plans. To have gateways operating smoothly, it is important to connect high-speed Internet. Penetration of the Internet has reached 60% in Costa Rica. This is one of the highest indicators in the sub-region. The prerequisite for the spread of broadband Internet access was the liberalization of the market, which ICE, the state-owned operator, had previously monopolized. Today, this company remains the major provider of fixed-line services, while its subsidiary RASCA offers broadband Internet. There is another popular Internet provider - Cabletica. In Costa Rica, an Internet connection is available via cable technology, WiMax, DSL/ADSL, and 3G. Satellite internet services are also available. 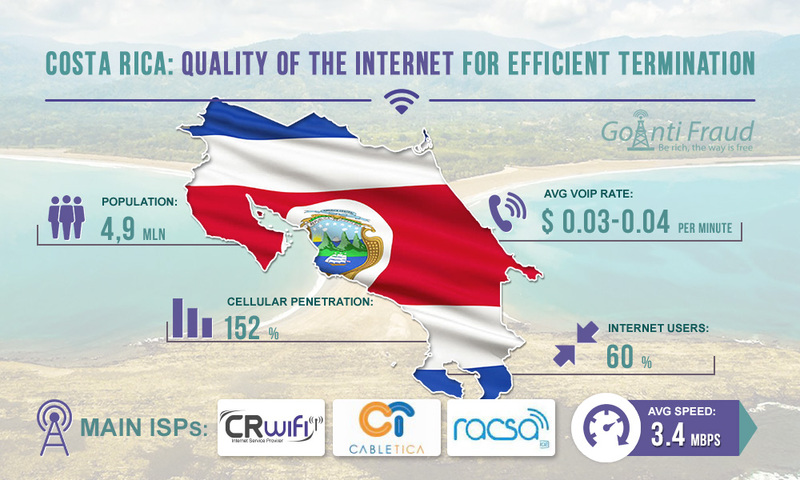 In Costa Rica, the broadband market is considered the most developed in Central America. Nevertheless, the network unevenly covers the territory. In addition, the country is on the list of 40 countries that have the lowest Internet speed. The average speed of a fixed Internet connection is 3.4 megabits per second, which is below the world average of 5.6 Mbps. Only 23% of all connections have a speed of 4 Mbit/s or more. However, this is sufficient for the normal operation of a GSM gateway that has a few channels. The average cost of an Internet service package in Costa Rica (with a data rate of 1 Mbit/s) is $60. By connecting a VoIP gateway router, you can efficiently terminate in Costa Rica.